Miniatures can literally take you way from the cares of the world to a place time has slowed down. Shrink down and come inside! This morning’s weather has changed to a damp rain. A pair of wellies by the door , the watercolor palette on the chair with binoculars are from this morning outing that ended when the damp rain began. Hot tea, fresh bread and rustic cheeses more than make up for the dash inside. A wonderful assortment of cheese to go with the bread and hot tea. A lazy cat enjoys the warmth of the fire besides the favorite rocking chair. Best spot in the cottage on a cold day! Upstairs is a sled bed with lots of warm blankets to snuggle under. I imagine the cat abandons the hearth with bedtime comes. The bed warmer is a recent find from a lot of copper things on ebay. It added to the mood. Imagine snuggling down is a toasty warm bed on a cold night after its use! This turned out so good! I do love aging and adding character to pieces. Going from a blank canvas to this …. is a total artistic escape for me. If I could give you a step by step instructions of the transformation I would, but it is like asking Grandma how she does a recipe that she doesn’t measure — just makes it! It leaves me perplexed by the inner workings of the mind that control the hands. How does that happen? My treasures collected over time have pulled together to breathe life into this cottage and given it a story! The coolest butter mold with an imprint is from a box of junk. No idea who made it but it is a cherished find. It sits on the counter by the fresh bread and butter dish. Actually has an imprint to press in the butter! A spot for the spice drawers – all which open. I know it is silly but I love knowing that. A wonderful rustic chicken print from Dominque Autin. Every one of her pieces are simple but done so well they delight me each time I look at them. The shelf sports a bottle of wine and special canned goods to be used for the arrival of someone special. The china in the shelves by the door are from my faux china painting days. This cabinet and dishes was a class I taught long ago with a few added pieces to round it out by Vince Stapleton and Valeria Casson. Oh the table! It is by Bradley Meinke. If you get a chance to take one of his wood finishing classes — do it! He is very sharing of his techniques. The chairs are odd ducks picked up at the Denver show. I love the faux bamboo look. Quirky but adds to the cottage character. I had a friend over and she was checking out the cottage interior. She said that one thing seemed out of place — the pipe on the mantle. Obviously, its a woman’s cottage — so why the pipe? Its a remembrance of a friend now gone. A reminder of many an evening shared by the hearth and the stories shared but not forgotten. For a bit of amusement — note the transformation of the skull candle into a normal warm candle. Another one of Dominque’s pictures hides the wiring. All in all … I can imagining walking through the cottage door and feeling instantly at home. I hope you are feeling the same! I had bought a half done project at a miniature show auction some time ago. It was a cottage from a Rik Pierce class. They are a lot of work but so beautiful when done. The structure was glorious but the exterior landscape had a swampy wetland with all kinds of creatures. A cauldron, swamp creatures and more rats! A rat in the flower bed! The previous owner’s intent was for a witch’s cottage. That was not an interest of mine. What to do with the poured resin swamp had me stumped. So it sat all this time waiting. Finally, I started to play house inside the structure this summer and ignored the exterior. A plan of action developed. The fantasy of a place away from the busy world tucked away in a woods emerged. The cottage began to have a personality – I pulled out the barren tree (so much easier in miniature than real life!) and covered the swamp with paper clay to get a landscape to support flower beds. This then sat for several months without any further work. The reality of how many plants this involved overwhelmed me. The dead tree is gone! Animal control has removed the rats. Not today – another day – was my response each time I started to think about it UNTIL an unexpected Christmas package arrived! My friend, Loretta Kasza had been talking about creating and making plants this fall but I hadn’t seen them. She sent me a batch of them! I think my cottage had simply been waiting for them! They were just perfect! I wish had had photographed before planting but didn’t plan that far ahead. So here is a peak of them in the ground so to speak. Flower beds emerged! Combined with my stash of plants collected over time, Loretta’s foliage plants and filler materials it became a lush cottage garden that I could envision enjoying living there in the cottage. A fimo butterfly from Lola’s Originals (in a drawer far too long) now rests on a hydrangea flower. Two of Loretta’s spectacular variegated plants show off the hydrangea bush. Then for fun, I added the dandelion growing in the rocks, it seems the gardener missed that one. The dandelion is by my friend, Twilla McKee. The corner became a composition with all the elements working together. I was thrilled! Another butterfly sits on my prize rose bush ( I can grow them in miniature it seems versus reality it is not so pretty. Kansas weather is rather harsh on them here). Another plant from the drawer stash. Along with a cadmium made ages ago. I even had some creatures to add to the garden. The path around the corner has a toad and a snail peaking out from the greenery. The lovely hosta is another of Loretta’s treasures. Can you see the ladybugs added to the plant to keep the aphids away? They were another forgotten treasure from the drawer stash. A pot of lavender on the bench by the door has a few more butterflies. Sitting beside it are a few vegetables harvested from the garden to add to the stew for supper tonight. The lavender is by Maryvonne Herholz. The bench is by R-stuff. No garden is complete without birds. A bird’s nest is tucked in on the porch roof and a chickadee is resting on a shutter momentarily add to the scene. It all pulled together and became a magical place to wander off to when I need time away from dirty dishes, laundry, etc. . Don’t get me wrong, reality is fine but an occasional daydream wandering about in a FINISHED setting gives me a perk of energy to return to the mundane chores of daily life. Now for the tour of the garden that I have been hinting about…. you are invited to step inside….. Sometimes I am enchanted with a single piece or vignette that I am not ready to put in a larger scene of a dollhouse or roombox so a small display under a dome is just the ticket. I can also rotate my treasures so things aren’t stale in my displays and my eyes can seek out the details up close when I am in the miniature mood. This fall I discovered some small glass domes at Michael’s that allow me to display a seasonal favorite or special miniature. They still carry them but they keep moving them around in the store. Currently they are in the fairy garden section. They are inexpensive, running about $5 to $7 with several sizes. They come in several sizes. Another cover for a small grouping is a cheese tray. I got this one at the thrift store for $3. I will admit the glass is thicker than a dome and distorts things a bit but the price was right. A footed glass cake stand is another option. Garage sales and estate sales can provide some interesting covers if you keep your eyes open. The luggage trio is by Bobbie Johnson of Colorado. I made the other 3 pieces many years ago. I am not sure who made the green trunk but I love the aged peeling affect it has for a well traveled look. Since I am on the subject of small displays, I wanted to share some of my favorites. Not all are dome covered but I wanted to share some eye candy. The spring garden display and gnome floral is by Laura Crain of Dollhouse Land. I love her use of color. Well balanced and feels like a bit of the outdoors captured. They always perk me up in the winter. The doll and 2 bunnies are some old favorites from the late 90’s. I have two of the dolls by the same artist that I got in 1997 when I was on the East coast at a miniature show. I have never seen her work since but love the detail. 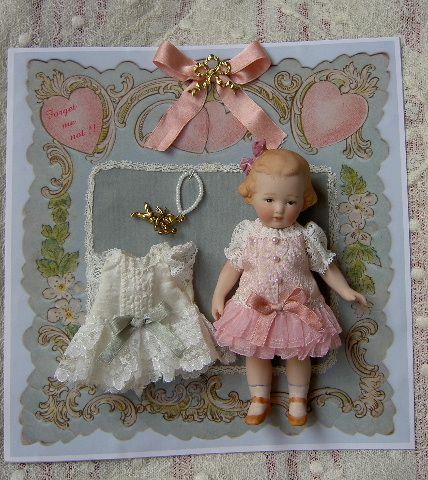 They have viscose hair, lace trim and ribbon added to the pinafores. All the rest is polymer clay. Here is the two dolls and their markings. If you know the artist’s name, I would love to know it. The bunnies are by Becky Delk. She made lots of sweet children and animals in the 90’s. She was at the Denver show and NAME conventions when I was able to get some of her creations. The detail is incredible with the dresses having checkered pattern, strips, etc all created with her manipulation of the clay. They amaze me. I think she burned out due to her work being so popular. The small gatherings under a dome or cover is a much better way to enjoy your miniatures than tucked away in a drawer until you have a place for it in a scene. In the creating of seasonal plants for my floral shop decked out for Thanksgiving I explored the aisles of the hobby shops for bits that I could use to add the proper seasonal colors. I found the nicest sprays that have a wide range of colors to work into the arrangements.They made great clusters of grapes in my turkey cart and were another texture/filler in the bouquets. It looks like something the floral department has for each season, just different colors, so I am checking for them this spring too. You may find some uses for them too.They were inexpensive and took acrylic paint well for touch ups. Magical transformations from one thing into something different is always a thrill! Here is a closeup of the cabinet. Carl designed it and was part of the shoppe class. It is a very nice display cabinet for foods. Anne Caesar from the Kitchen Captive made the cookies on the cake stand and boxed ones on the right side of the shelf. The boxes are mine, named Old Castle boxes(not the most creativity title). They are great fillers. On the third shelf are my clover boxes filled with meringues that I made. The boxed rose candies are beads but look great as molded chocolates. The belingot container on the left is a favorite. The subtle coloring of the bonbons always draw my eye to them.